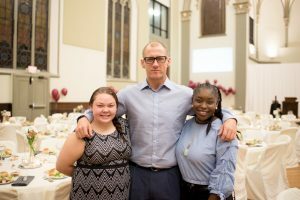 On Saturday, November 18th, Community Matters and Education Matters hosted our annual winter gala, An Evening in Lower Price Hill, sponsored by Sisters of Charity of Cincinnati, Ross, Sinclaire & Associates, and Strauss Troy, Attorneys at Law. More than 200 guests joined us for the evening, enjoying stories from our MC, Lucy May of WCPO, beautiful music from MYCincinnati, dinner provided by Current Catering, and amazing dessert from Pleazant Treatz. We welcomed guests with an open bar and awesome raffles including Disney World tickets, a vacation to South Carolina, Dinner with cookbook author and chef Perry Washburn, and much, much more! Guests got to hear from community members, Aaron Head and Keaura Powell, and staff member, Erica Ninneman, on how the work of Community Matters and Education Matters has impacted their lives personally and the community as a whole. Aaron received a standing ovation when he finished speaking about his fight against addiction, the support he has received from Community Matters and Education Matters, and the work he is doing to help others come out victorious in their own battles. We were also able to honor long time volunteer Tami Woods, Lower Price Hill leader Tony Thomas, and the partnership of Adelyn Hall, the Community Learning Center Institute, and Habitat for Humanity of Greater Cincinnati for their work on developing affordable, single-family housing in the community. An Evening in Lower Price Hill raised over $45,000 to help us support our work in the Lower Price Hill community over the next year. Andres Tolentino, Barnes, Dennig & Co, Cincinnati Development Fund, Cincinnati Industrial Auctioneers, Cincinnati State Technical & Community College, Cory Bultema, Jeff Dey, Hart Pharmacy, Plummer, Daffin & Associates, Ryan Wealth Strategies, Scott & Sarah Priestle, US Bank, Current Catering, Dan & Nancy Hippensteel, and Squire Patton Boggs. Lucy May, Pleazant Treatz, and MYCincinnati.